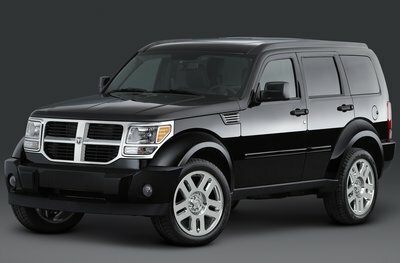 The blocky Dodge Nitro has broad-shouldered styling that is intended to appeal to a macho clientele. A standard 210-bhp 3.7L V-6 is mated to a 4-speed automatic and permanent 4WD. Standard 20-inch alloy wheels add to the Nitro's bold look. Although Dodge claims that the Nitro is fun to drive, a 0-60 mph time of 9.6 seconds is hardly impressive. No doubt the automatic transmission and 4,115 lb. curb weight hurt performance. Interior features include chrome/red/silver trim, a first-aid kit, an easily cleaned vinyl-covered rear cargo area, and DVD navigation. An all-new small SUV based on the Jeep Liberty underpinnings. The Nitro is available with a choice of two V-6 engines: 3.7L (210-bhp) and 4.0L (255-bhp). A sport suspension is standard on the Nitro R/T (optional on the SLT). Transmissions include a 4-speed (SLT) and 5-speed (R/T) automatics. All models are available in 4x2 and 4x4 versions.